Brand new 1:50 scale diecast car model of Komatsu GD655-5 Motor Grader with Ripper and Figure with GPS Base and Rover die cast car model by First Gear.Topcon Positioning System detailsIncludes figure with GPS Base and RoverPoseable drawbar mounted circel with 360 degree rotationFully detailed operator control centerRear mounted multi-shank ripperTopcon Positioning System detilasApproximate Dimensions: 8"L x 3.5"W x 3"H inches.Komatsu GD655-5 Motor Grader with Ripper and Figure with GPS Base and Rover 1/50 Diecast Model by First Gear. Brand new 1:50 scale diecast car model of Komatsu GD655-5 Motor Grader with Ripper die cast car model by First Gear.Poseable drawbar mounted circel with 360 degree rotationFully detailed operator control centerRear mounted multi-shank ripperTopcon Positioning System detilasApproximate Dimensions: 8"L x 3.5"W x 3"H inches.Komatsu GD655-5 Motor Grader with Ripper 1/50 Diecast Model by First Gear. Brand new 1/50 scale diecast model of Komatsu GD655-6 Motor Grader with Ripper die cast model by First Gear.Brand new box.Real rubber tires.Detailed interior exterior.Diecast metal construction.Rear mounted multi-shank ripper.Fully detailed operator control center.Dimensions approximately L-8.5 W-3.5 H-3 inches.Poseable drawbar mounted circle with 360 degree rotation. 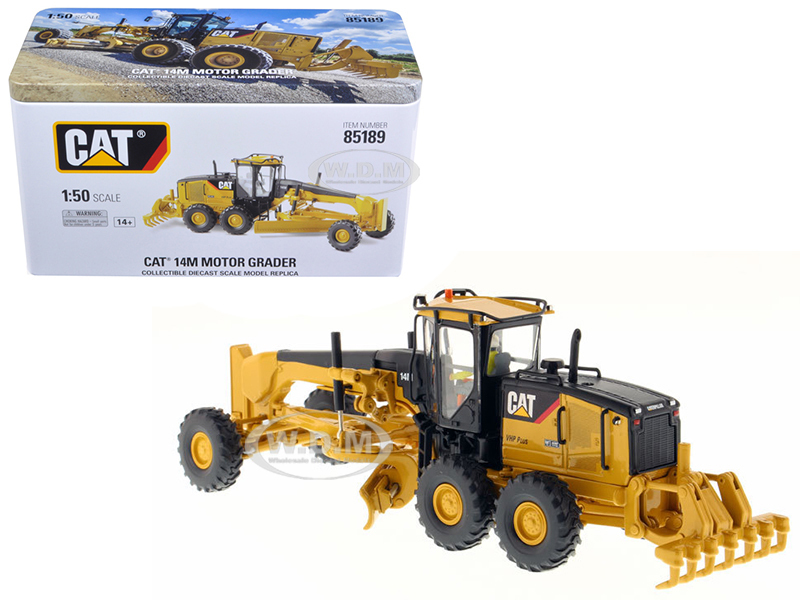 Brand new 1:50 scale diecast car model of Komatsu GD655-5 Motor Grader with V-Plow & Wing die cast car model by First Gear.Fixed position V-plowPoseable drawbar mounted circle wtih 360 degree rotationFully detailed operator control centerPoseable wing plowApproximate Dimensions: 9.5"L x 3.5"W x 2.75"H inches.Komatsu GD655-5 Motor Grader with V-Plow & Wing 1/50 Diecast Model by First Gear. 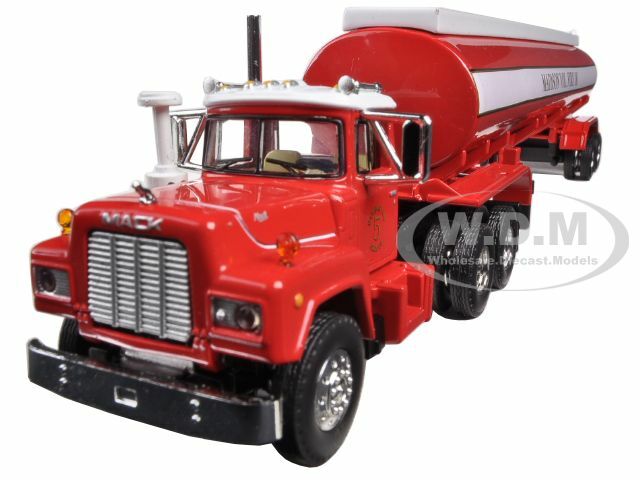 Brand new 1:64 scale diecast model of Mack R-Model with 42 Water Tank Trailer Madison Fire Co. die cast model by First Gear.Brand new box.Rubber tires.Detailed interior exterior.Made of diecast metal.Detailed cab interiorDetailed tractor chassis and undercarriagePivoting fifth-wheel for trailer attachmentFunctioning trailer landing gearFront and rear trailer fendersRear trailer ladderDetailed fill tubes and coversChrome details throughoutDimensions approximately: 10.5"L x 2.15"W x 1.75"H.Mack R-Model with 42 Water Tank Trailer Madison Fire Co. 1/64 Diecast Model by First Gear. Brand new 1/34 scale diecast model of Mack Granite Waste Management with Tub-Style Roll-Off Container Garbage Truck die cast model by First Gear.Brand new box.Real rubber tires.Removable roll-off container.Accurately detailed cab interior.Authentic chassis and undercarriage.Made of diecast with some plastic parts.Opening hood with authentic engine detail.Detailed interior exterior engine compartment.Authentically functioning roll-off frame slides and tilts.Dimensions approximately L-12.5 W-3.5 H-4.125 inches. 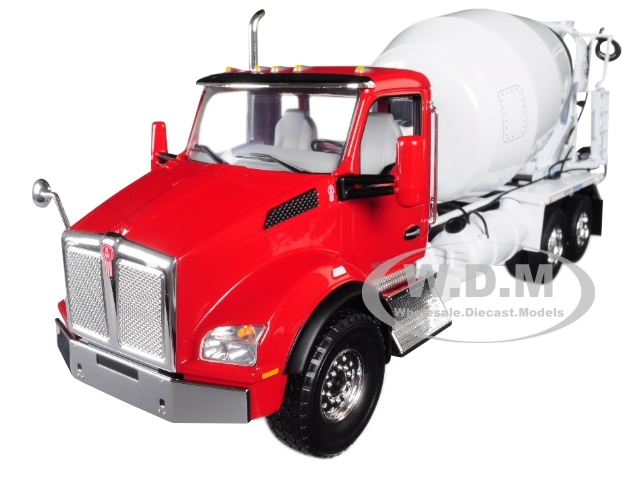 Brand new 1:34 scale diecast model of Kenworth T880 with McNeilus Standard Mixer Red Cab/ White Body die cast model by First Gear.Brand new box.Real rubber tires.Rotating mixer drum.Detailed undercarriage.Detailed interior exterior.Accurately detailed cab interior.Poseable chute with chute extensions.Made of diecast with some plastic parts.Kenworths MX optimized hood configuration.Dimensions approximately L-10.75 W-3.5 H-4.5 inches. 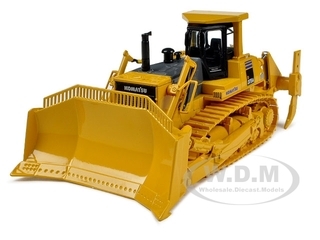 Brand new 1:50 scalediecast car model of Komatsu D375A Crawler Dozer with Blade & Ripper die cast car model by First Gear.Adjustable bladeWorking segmented metal tracksFully detailed operator control centerPoseable mulit-shank ripperApproximate Dimensions: 8.5"L x 4"W x 3.5"H.Komatsu D375A Crawler Dozer with Blade & Ripper 1/50 Diecast Modelby First Gear. 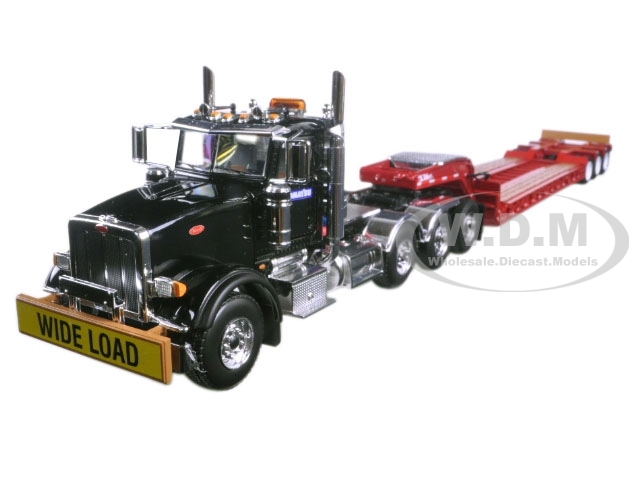 Brand new 1/50 scale diecast model of Peterbilt 367 "Komatsu"with Tri Axle Lowboy Trailer Black and Red die cast model by First Gear.Brand new box.Real rubber tires.Opening hood and doors.Made of diecast with some plastic parts.Pivoting fifth-wheel for trailer attachment.Detailed interior exterior engine compartment.Swing-out outriggers with side plank extensions.Detachable gooseneck with functioning load ramp.Approximate dimensions: L-17 W-2.5 H-2.75 inches. 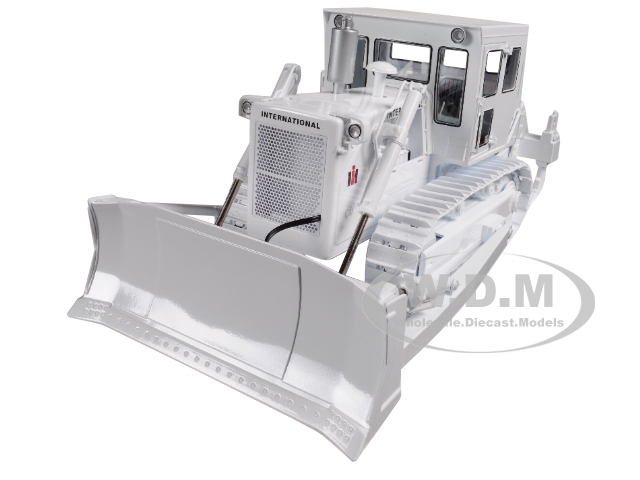 Brand new 1:25 scalediecast model of International Harvester TD-25 Dozer with Enclosed Cab and Ripper White die cast model by First Gear.Brand new box.Diecast metal construction.Adjustable semi-U blade.Enclosed cab with opening doors.Detailed cab interior.Working segmented metal tracks.Poseable multi-shank ripper.Replica Operators Manual included.Dimensions approximately 10.5"L x 6.25"W x 5.25"H inches.Recommended for ages 14 and over. 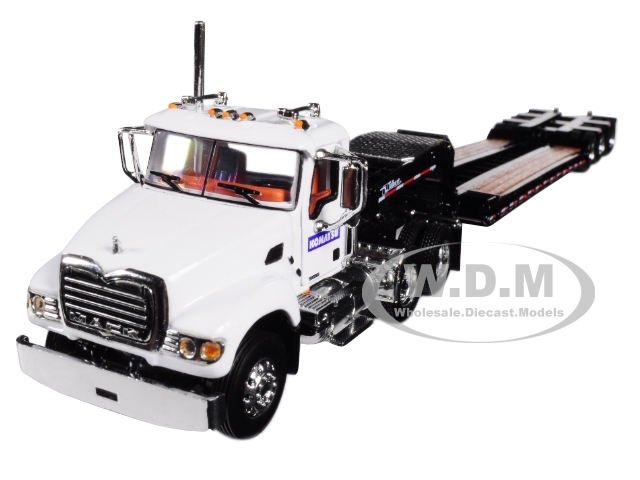 Brand new 1/34 scalediecast model of International LT Day Cab "Komatsu" with "Ledwell" Hydratail Trailer White and Blue die cast model by First Gear.Brand new box.Real rubber tires.Functioning trailer tail.Diamond plate deck detail.Accurately detailed cab interior.Poseable fold-under loading ramp.Authentic chassis and undercarriage.Made of diecast with some plastic parts.Diecast chassis with functioning front ramp.Two-tone wood grain deck detail on trailer bed.Detailed interior exterior engine compartment.Dimensions approximately L-23.75 W-3.5 H-3.75 inches.Mini-deck features two chain pans with chain and chain tightening detail. Brand new 1/50 scalediecast model of Komatsu D65PX-17 Dozer with Hitch die cast model by First Gear.Brand new box.Rear hitch.Detailed interior exterior.Working segmented metal tracks.Adjustable power-angle tilt blade.Fully detailed operator control center.Made of diecast with some plastic parts.Dimensions approximately L-4.5 W-3 H-2.5 inches. Brand new 1:64 scale diecast model of Mack R Model With 28 Pop Trailer Murphy Motor Freight die cast model by First Gear.Brand new box.Rubber tires.Detailed interior exterior.Made of diecast metal.Opening hood with complete engine detailFully detailed cab interiorCab air deflectorPivoting fifth-wheel for trailer attachmentsDetailed chassis and undercarriageWorking Trailer landing gearRear roll-up doorsDimensions approximately: 8"L x 1.75"W x 2.75"H inches.Mack R Model With 28 Pop Trailer Murphy Motor Freight 1/64 Diecast Model by First Gear. 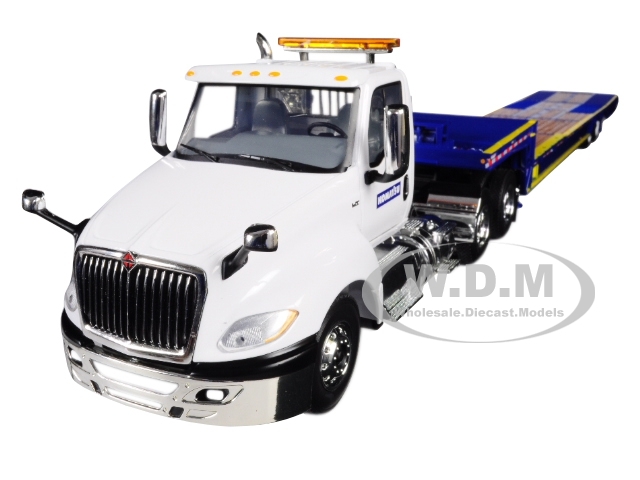 Brand new 1:50 scale diecast model car of Komatsu D51PXi-22 Dozer with Hitch die cast model by First Gear.Adjustable power-angle tilt blade.Working segmented metal tracks.Fully detailed operator control center.Rear hitch.Dimensions approximately: 4.25"L x 2.5"W x 2.75"H inches.Komatsu D51PXi-22 Dozer with Hitch 1/50 Diecast Model by First Gear. Brand new 1/64 scale diecast model of Mack Granite "Komatsu" with Tri Axle Lowboy Trailer die cast model by First Gear.Brand new box.Rubber tires.Detailed interior exterior.Made of diecast metal.Opening hood with authentic engine detail.Opening doors with accurately detailed cab interior.Detailed chassis and undercarriage.Pivoting fifth-wheel for trailer attachment.Detachable gooseneck with functioning load ramps.Dimensions approximately: 12.5L x 2"W x 2.25"H inches. 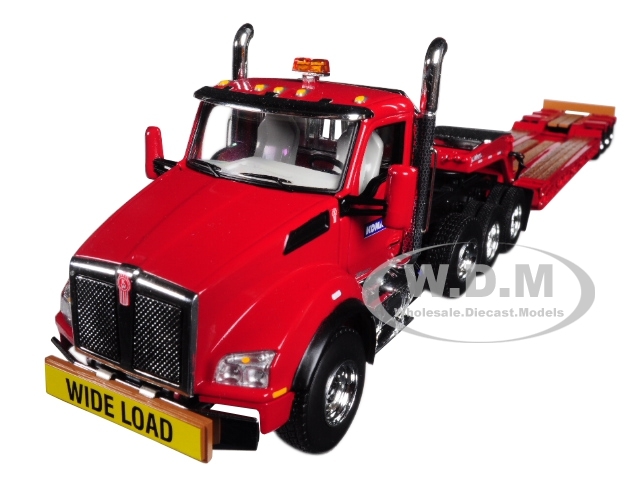 Brand new 1/50 scale diecast model of Kenworth T880 "Komatsu" with Tri Axle Lowboy Trailer Red die cast model by First Gear.Brand new box.Rubber tires.Steerable front wheels.Pivoting fifth-wheel for trailer attachment.Opening hood with complete engine detail.Made of diecast metal with some plastic parts.Swing-out outriggers with side plank extensions.Detachable gooseneck with functioning load ramp.Approximate dimensions: L-17 W-2.25 H-2.75 inches. 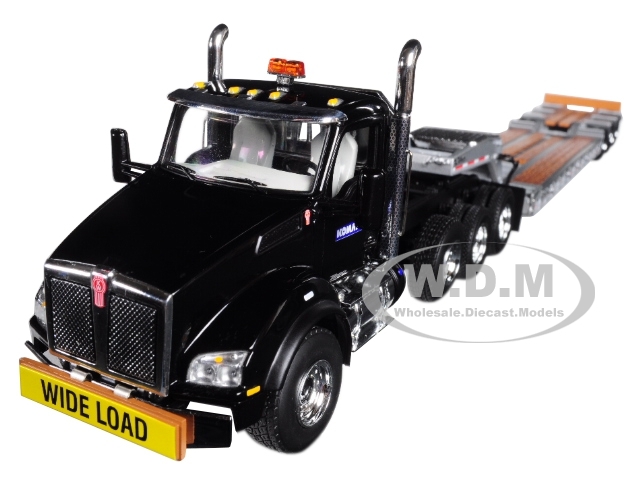 Brand new 1/50 scale diecast model of Kenworth T880 "Komatsu" with Tri Axle Lowboy Trailer Black/Silver die cast model by First Gear.Brand new box.Rubber tires.Steerable front wheels.Pivoting fifth-wheel for trailer attachment.Opening hood with complete engine detail.Made of diecast metal with some plastic parts.Swing-out outriggers with side plank extensions.Detachable gooseneck with functioning load ramp.Approximate dimensions: L-17 W-2.25 H-2.75 inches. 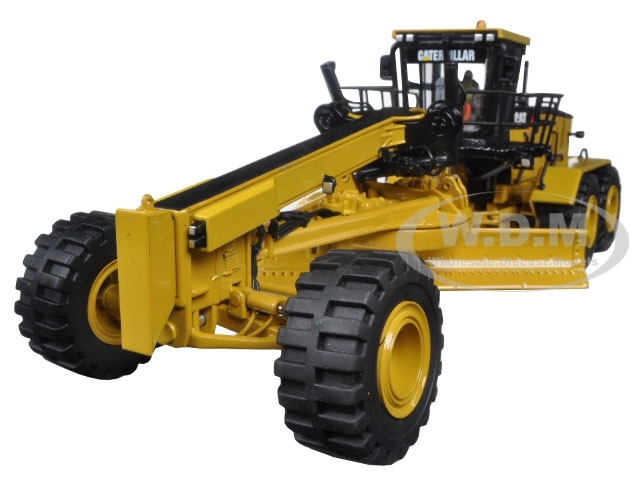 Brand new 1:50 scale diecast car model of Komatsu WA500-7 Wheel Loader die cast car model by First Gear.Adjustable loader arm and tilting load bucketFully detailed cab interiorArticulating chassis steer ability and vinyl tiresApproximate Dimensions: 7.75"L x 2.75"W x 3"H inches.Komatsu WA500-7 Wheel Loader 1/50 Diecast Model by First Gear. Brand new 1/50 scale diecast model of Komatsu 830E-AC Dump Truck die cast model by First Gear.Brand new box.Real rubber tires.Tilting dump body.Poseable front wheels.Fully detailed cab interior.Includes set of chock blocks.Diecast metal railing and stairs.Floating spring loaded rear suspension.Made of diecast with some plastic parts.This model does not have any openings.Approximate dimensions L-11 W-6.75 H-5.25 inches. Brand new 1/50 scale diecast model of CAT Caterpillar 14M Motor Grader with Operator "High Line Series" die cast model by Diecast Masters.Brand new box.Rear frame articulation.Detailed interior exterior.Rear ripper rises and lowers.Revised Norscot Item # 55189.Front wheel steering and axle articulation.Oscillating tandem left and right rear wheels.Made of diecast metal with some small plastic parts.Dimensions approximately: L-8 1/2 W-3 3/8 H-2 3/4 inches.Moveable drawbar circle and moldboard for blade positioning.High Line Series Packaging:Collectible full-color printed metal box including machine photos and specifications.Die-cut foam insert protects model within the box. Cardboard outer box provides additional protection. 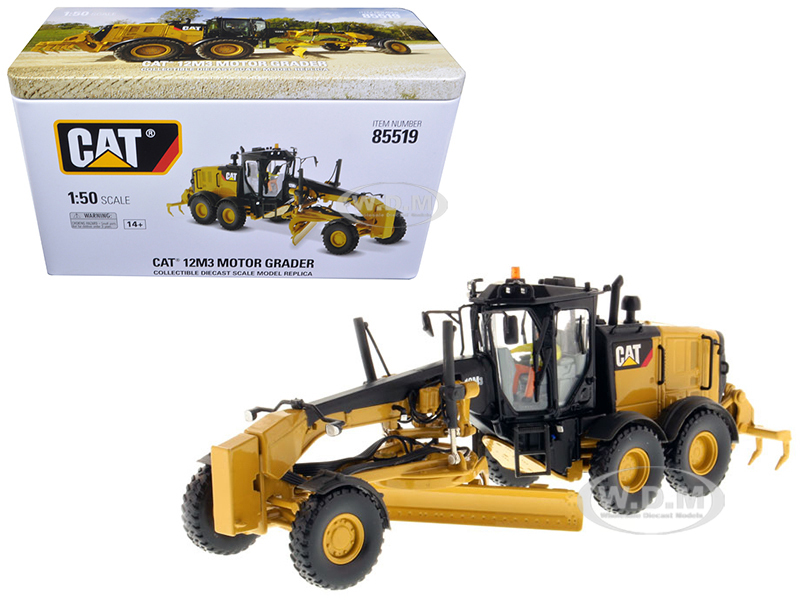 Brand new 1/50 scale diecast model of CAT Caterpillar 140M Motor Grader with Operator "High Line Series" die cast model by Diecast Masters.Brand new box.Rear frame articulation.Detailed interior exterior.Authentic Cat trade dress.Authentic tire tread design.Rear ripper raises and lowers.Revised Norscot Item # 55236.Authentic Cat Machine Yellow paint.Detailed cab interior including operator.Moveable drawbar circle and moldboard.Front wheel steering and axle articulation.Oscillating tandem left and right rear wheels.Made of diecast metal with some small plastic parts.Dimensions approximately: L-8 W-2 H-2 5/8 inches.High Line Series Packaging:Collectible full-color printed metal box including machine photos and specifications.Die-cut foam insert protects model within the box. Cardboard outer box provides additional protection. 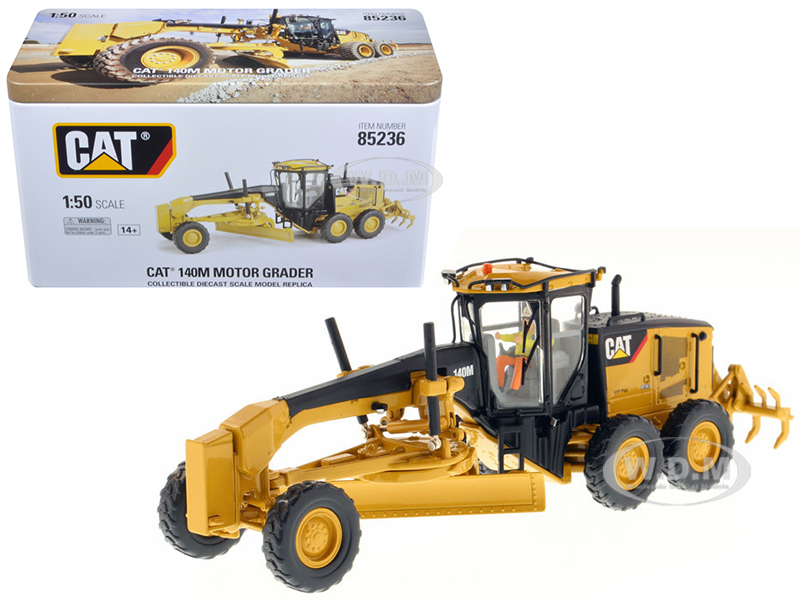 Brand new 1/50 scale diecast model of CAT Caterpillar 12M3 Motor Grader with Operator "High Line Series" die cast model by Diecast Masters.Brand new box.Rear frame articulation.Detailed interior exterior.Authentic Cat trade dress.Authentic tire tread design.Rear ripper raises and lowers.Authentic Cat Machine Yellow paint.Detailed cab interior including operator.Moveable drawbar circle and moldboard.Front wheel steering and axle articulation.Oscillating tandem left and right rear wheels.Made of diecast metal with some small plastic parts.Dimensions approximately: L-8 W-2.625 H-2.875 inches.High Line Series Packaging:Collectible full-color printed metal box including machine photos and specifications.Die-cut foam insert protects model within the box. Cardboard outer box provides additional protection. 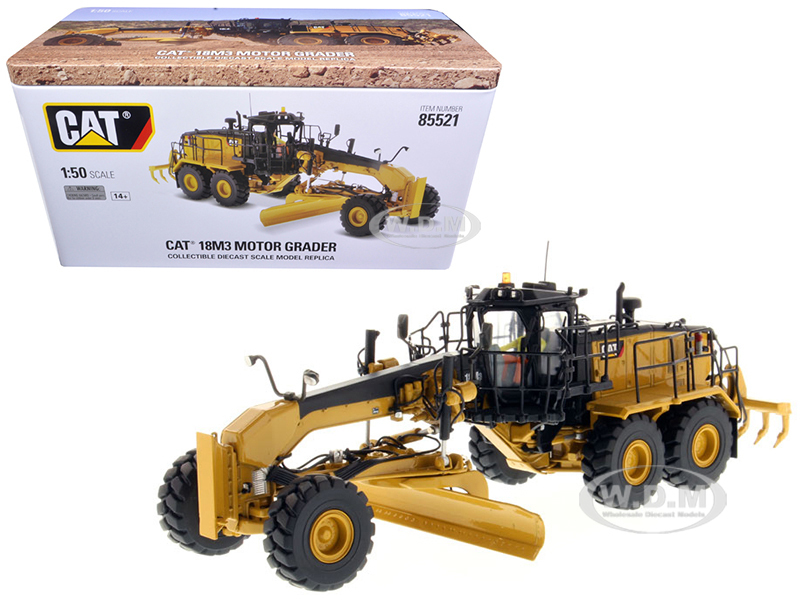 Brand new 1/50 scale diecast model of CAT Caterpillar 18M3 Motor Grader with Operator "High Line Series" die cast model by Diecast Masters.Brand new box.Real rubber tires.Authentic tire tread design.Interchangeable work tools.Center pivot backhoe design.Boom raises lowers and swings.Authentic Cat Machine Yellow paint.Front wheel steering with oscillating axle.Detailed interior exterior and an operator.Authentic Cat trade dress and safety decals.Left and right stabilizers with pads raise and lower.Made of diecast metal with some small plastic parts.Dimensions approximately: L-9.5 W-3 H-4.375 inches.High Line Series Packaging:Collectible full-color printed metal box including machine photos and specifications.Die-cut foam insert protects model within the box. Cardboard outer box provides additional protection.